Performers include: Michael Weston, Stephen Mangan, Rebecca Liddiard, Tim McInnerny, Adam Nagaitis, and Diana Quick. This mystery adventure drama series revolves around the uneasy partnership of two legendary figures of the early 20th Century. Harry Houdini (Michael Weston) is a master magician, escape artist and paranormal debunker. Meanwhile, Arthur Conan Doyle (Stephen Mangan) is a prolific writer and the creator of the master detective “Sherlock Holmes” character. He’s also a paranormal aficionado. They grudgingly join forces with New Scotland Yard to investigate unsolved and unexplained crimes with a supernatural slant. They partner with Constable Adelaide Stratton (Rebecca Liddiard), the first female constable ever to work for the London Metropolitan Police Force. Tasked with the cases that nobody else can solve, their sense of what is real and what is not is challenged. Houdini is a skeptic, while Doyle believes in the unseen. Their diverse viewpoints make solving crime a challenge — and Stratton is often put in the middle. She’s embarrassed when the two wager on a case’s outcome. Do their cases truly involve vampires, ghosts, monsters and poltergeists or, are they a ruse to conceal something more ordinary — like murder? Other characters include Chief Inspector Horace Merring (Tim McInnerny), Sergeant George Gudgett (Adam Nagaitis), and Cecelia Weis (Diana Quick). When all but two residents (a priest and a child) of a small village die simultaneously, and with no signs of violence, the trio must uncover whether or not this tragedy is divine revenge for the murderous founding of the town. Meanwhile, Adelaide’s discoveries about her dead husband’s past finally prompt her to ask the others for help, Doyle begins writing “The Hounds of the Baskervilles” and Houdini’s anguish is evident. First aired: July 4, 2016. What do you think? 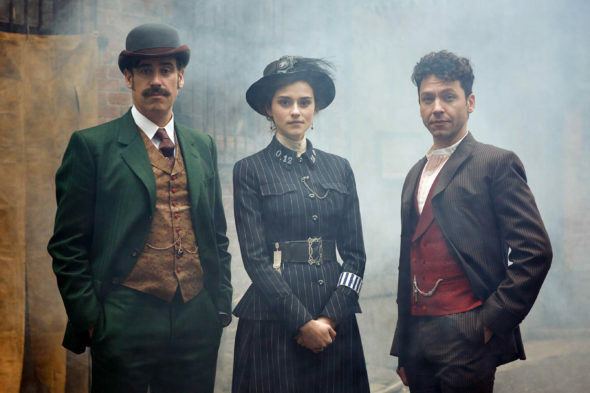 Do you like the Houdini & Doyle TV show? Do you think it should be cancelled or renewed for another season? Ugh, my heart! I loved this show. I kept wondering why I hadn’t heard anything about the new season! Please bring it back!!! One of the best original shows in yrs. Someone please bring it back in production!